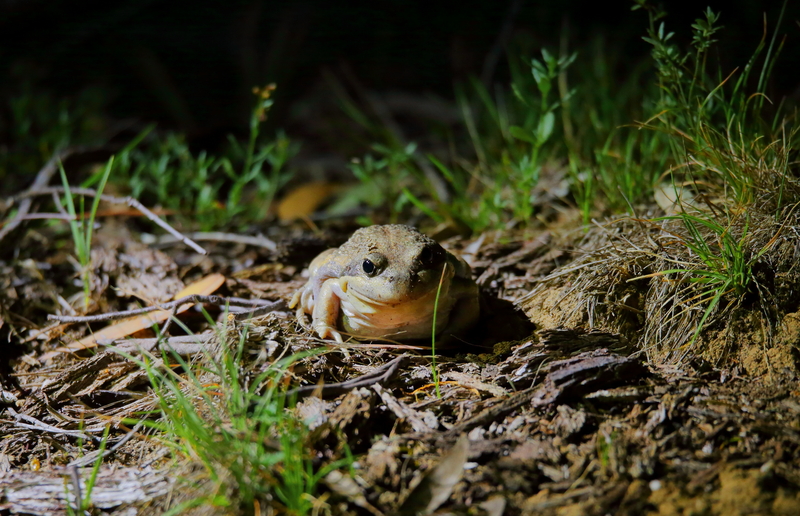 Last night we went on a spotlight walk in an area that is an island of forest to the north of the Wombat forest, as part of the Spotlight on Species walks a partnership between the Upper Campaspe Landcare Network and the Macedon Ranges Shire Council Environment department. It was a well attended walk and while we did not spot any powerful owls or greater gliders we did see plenty of interesting things and it was a lovely wander. I love being in the forest a night. 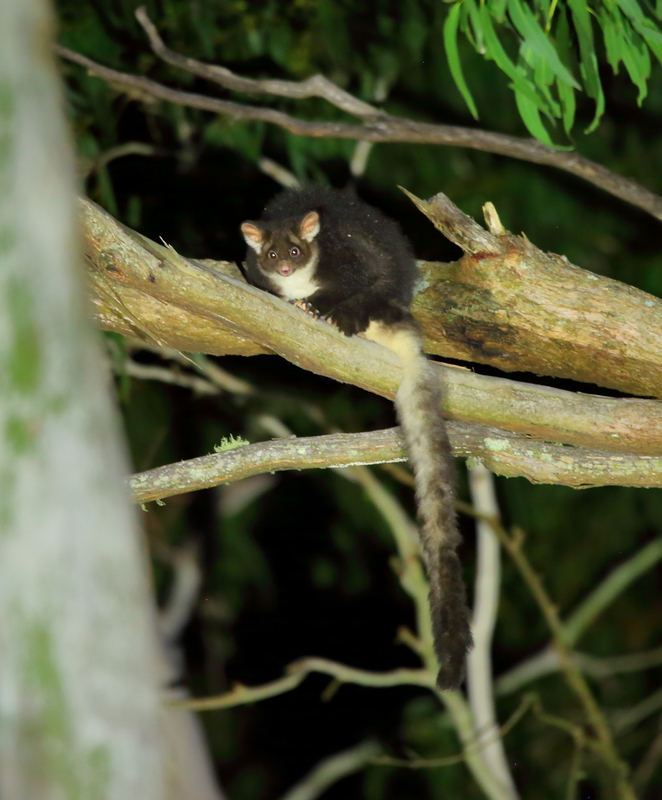 The thump of a wallaby as it hops off into the darkness, the sounds of sugar gliders chattering in the trees and the quiet crunching of parrots nibbling eucalypt seeds in the canopy. 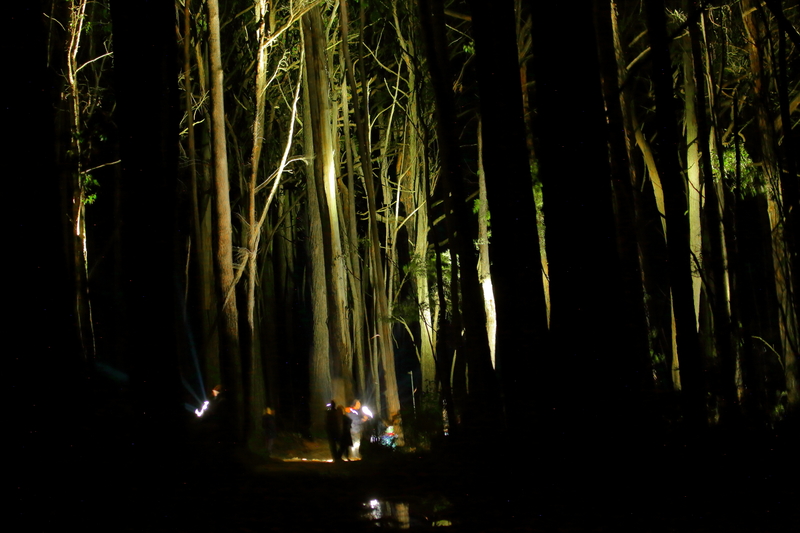 It is amazing how using a spotlight can focus your searching, not just in the trees but also on the ground. You see bugs and beetles you would just never see in daylight and plants so easy to walk past in daylight just pop out into focus. 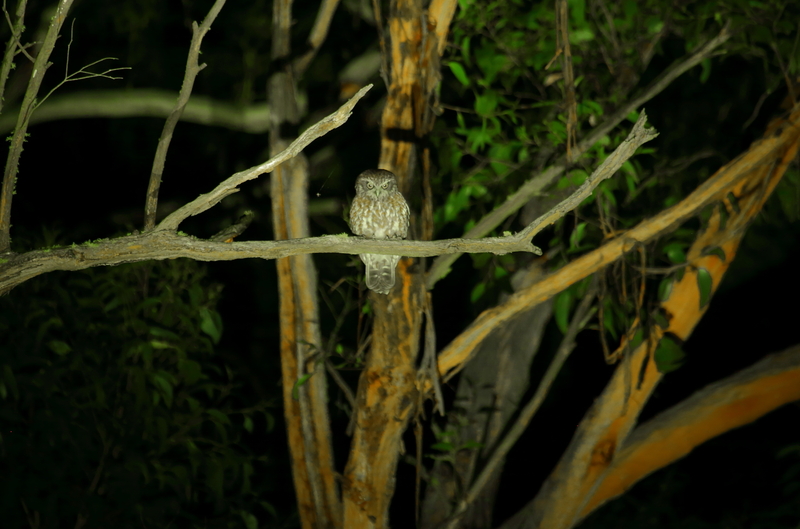 My highlight of the night was a Southern Boobook Owl, it is not often one sits long enough to get some photos. A brief respite in the summer heat and a few drops of rain raised spirits and gave the whole environment a chance to draw breath. There is nothing like the smell of summer rain in the Australian bush. It is a heady smell of freshness and eucalyptus unique to the Australian bush, hard to describe but it raises the spirits and the whole environment seems to heave a collective sigh of relief. Although we only had some brief showers the light rain refreshed everything, humans, plants and animals alike. We had a visit from one of our local male Koalas. His territory overlaps our place here and he is a regular visitor. Koalas can be very hard to see and find which is surprising given their size. But tucked in against a tree trunk or when they get up in the canopy they are so hard to spot. It is nice to be able to show him being so active, during the day they tend to just sit, especially in the heat of summer. At different times of the year they feed on different trees. Over the last few months I have noted they were feeding on Messmate stringybark, Eucalyptus obliqua. The Manna Gums, Eucalyptus viminalis have just started putting on new growth and so I guess he is after the fresh green foliage so this likely accounts for the shift in diet. I enjoy seeing and noting changes like this as it gives you a understanding of how all the environment is connected together, a sum of lots and lots of smaller parts and actions. This male was nice and close to the house so was spotted as he moved about, otherwise finding a Koala is a lot like looking for a needle in a haystack, too many trees and very few animals. As far as I can tell the population here, while small, is pretty stable and sustainable. If you live in the Central Victoria there is an active monitoring project where you can log a Koala sighting and I encourage you all to do so. Macedon Ranges Koala Project It is a great way of monitoring our populations and participating in citizen science and the sight contains a wealth of local Koala information. Finally to the stars. We had a run of clear nights here and I needed no excuse to timelapse our wonderful night skies. Each shot essentially runs for an entire night so while time consuming the results I think are spectacular. The Milky Way and Magellanic Clouds are spectacular at the moment and make it worthwhile going outside and just looking up once the sun sets on clear nights. Our altitude here, 600m (just under 2000ft) means we are often get clearer skies and great views of the stars. So enjoy our night skies of January. Until next week.